Goodyear vs Michelin tires is the most debated versus today. Both companies make really good tires from regular sedans to SUVs and Trucks. So, which one is the best? The answer is not that simple and it depends on several factors. Here we can find the Assurance ComforTred Touring from Goodyear and Primacy MXM4 from Michelin. In most tire test found online, the clear winner was Michelin Primacy MXM4. It is a better tire, even if by a small margin, compared with the Goodyear Assurance. We will find here the Pilot Super Sport from Michelin and Eagle F1 Asymmetric 2 from Goodyear. Michelin Pilot Super Sport is a well known Max Performance Summer tire and is far better than the Goodyear Eagle F1 Asymmetric 2. The Michelin Pilot Super Sport provides incredible performance in dry conditions. This, combined with good road manners, make it the best Performance Summer Tire available on the market. In wet situations this tire performs good but not great. It has to do with its tread pattern that performs better on dry roads. On dry roads it is the best performance summer tire available on the market. The Michelin ruled the dry testing, both in outright performance and subjective steering feel, but it struggled in the wet running, one of the slowest on test. 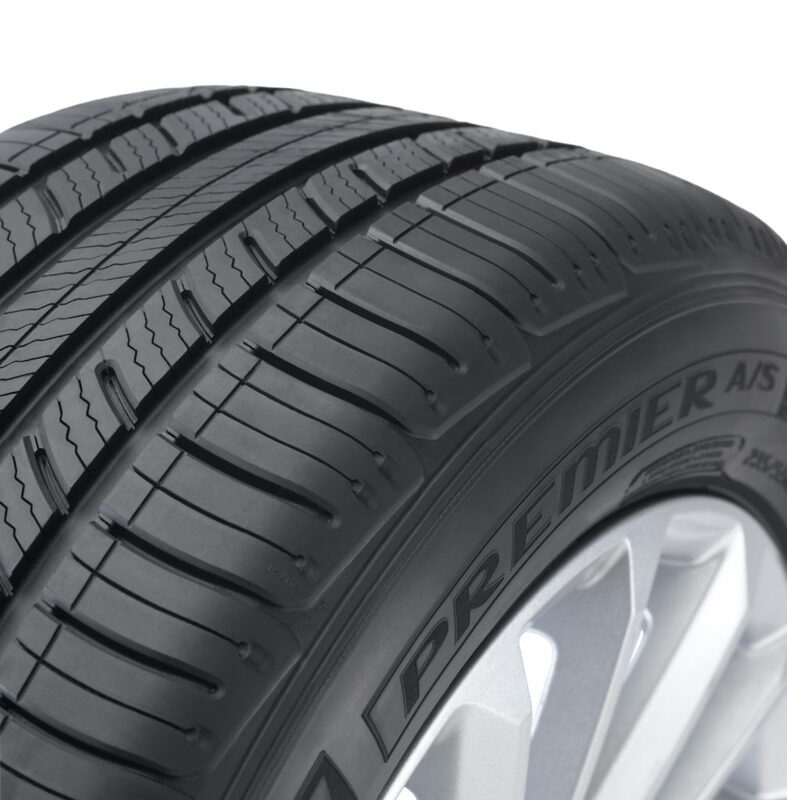 The Goodyear Eagle F1 Asymmetric 2 offers excellent traction on wet surfaces, and good traction on dry roads but is not as good as the Michelin. The steering response is just not as good compared with the Michelin. This tire offers good wet handling and steering and decent road noise. It is an all around good tire, but on dry roads is not as good as the Michelin. Here we find the Assurance TripleTred All-Season from Goodyear and Defender from Michelin. The Goodyear is the winner in this section especially due to its excellent wet traction and hydroplaning resistance. Ride comfort and dry traction are also good. Most customers were impressed by the Assurance TripleTred All-Season overall performance and recommend it as the number one Passenger All-Season tire. The Michelin Defender is an excellent tire, but the Goodyear is just a little bit better. Even so, this is a good tire with excellent traction on dry, wet or slushy roads. But the tread life is not that good. Most consumers complained that this tire will last less than 50K miles. Here Goodyear is the king because of the Assurance CS TripleTred All-Season tire. This one ranks higher than the Michelin Latitude Tour. Goodyear Assurance CS TripleTred All-Season is designed as a premium SUV/Crossover Touring All-season tire. It can be used the entire year and has incredible good performance on snow, for an all-season tire. This tire has excellent dry and wet performance but decent traction on ice. This is normal, since this is not a proper winter tire. If you live in those areas with lots of snow, freezing temperatures and icy roads buy dedicated winter tires, not all-season ones. The only downfall of this tire is the road noise, which is a bit higher than other all-season touring tires. This is a good Touring All-Season SUV Tire but not excellent. It has decent traction on wet surfaces and excellent traction on dry roads. In the snow however, it performs quite bad compared with the Assurance CS TripleTred All-Season. On slushy roads the car tends to be a bit unstable when equipped with these tires. Most buyers complained about this aspect, aside from the poor ice traction. In this category we can find the Goodyear Wrangler SilentArmor and Michelin LTX A/T2. You can learn more about Goodyear Off-road tires here. Michelin LTX A/T2 is a well known all-terrain tire with incredible good road performance and excellent traction on wet and slushy surfaces. Combine this with an excellent tread life and good off-road abilities and you get and incredible good and versatile tire. Goodyear Wrangler SilentArmor is not as good on dry roads, compared with the Michelin, but is far better off-road. Due to its aggressive pattern is better suited for those living mostly in isolated places. It has good dry and wet traction but Michelin is a little better. When it comes to premium brands, such as Michelin and Goodyear the choice is not always rational, but mostly sentimental. Both brands have excellent tires and each of them have the best tire is a certain category, while being in top 3 or top 5 in other. In this article we mentioned just a few tires from Michelin. If you want to learn more about Michelin Tires check out our Top Best Michelin Tires for SUV. The choice is your, since only you, the consumer, know what tires do you need and how much do you intend to spend on them. Next Post:Are Mud Tires good in Snow?